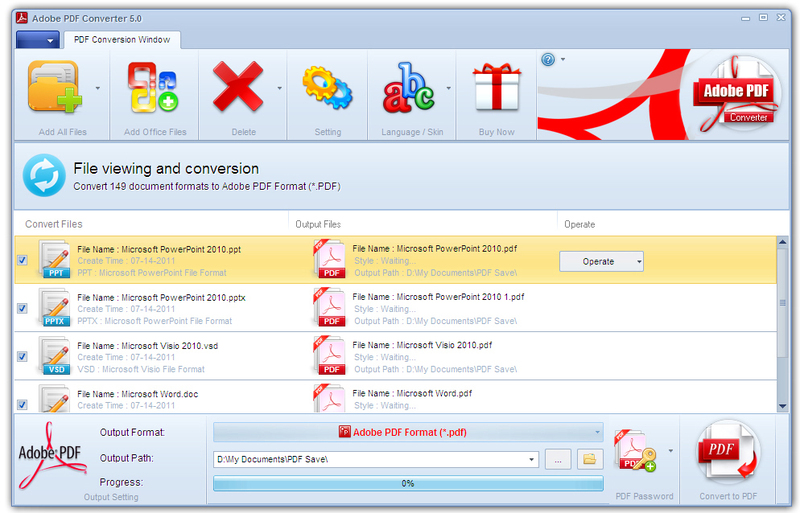 Adobe PDF Converter can Convert PDF documents from over 140 File Formats. Including Microsoft Word (DOC, DOCX), Microsoft Excel (XLS, XLSX), Microsoft PowerPoint (PPT, PPTX), Microsoft Visio (VSD), Microsoft Works (WDB, WPS, DOCX, XLSX), AutoCAD (DWG, DXF, DWF), CorelDraw (CDR), Corel Presentations (SHW), WordPerfect (WP5, WP6, WPD, WPF), WordStar (WS), DocuWorks (XDW), QuattroPro (WB1, WB2, WQ1), Rich Text Format (RTF), Text Format (Txt), Hyper Text Markup Language (Htm, Html), Windows Bitmap (BMP), JPEG Compressed Image (JPG, JPEG, JP2) etc File Formats to PDF Formats. Adobe PDF Converter can set individual or all of the PDF open password. Adobe PDF Converter is a multilingual software, including English, Chinese, German, French, Italian, Japanese and Very user-friendly interface and easy to use. Very quick in read speed and no quality is lost!